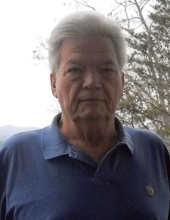 Celebrating the life of Dorsey Duffie, Jr.
Obituary for Dorsey Duffie, Jr.
Dorsey “Coot” Duffie, Jr., 67, of Hampton passed away on Thursday, January 24, 2019 at his home. He was born on April 20, 1951 in Franklin, Georgia to the late Dorsey and Catherine Duffie, Sr. He was a devoted family man and loved fishing, old cars, and western movies. He was a retired electrician from Brand Electric. Dorsey was preceded in death by his parents; son, Justin Duffie in 2017; and his brother, Robert Duffie. He is survived by his loving wife, Elizabeth “Tootibelle” Duffie; sons, Scott Duffie and Joshua (Christy) Duffie; “daughter”, Amanda Weyrauch; grandchildren, Coley Duffie, Chassidy Pruitt, Haley Duffie, Caitlin Duffie, Carter Duffie, Ansley Duffie, and Madison, Jaylin, Adonis, and Braeden Weyrauch; great-grandchildren, Perry and Dakota Duffie; daughters-in-law, Stacey Cogburn and Sara Barron; and nephews, Michael and Noah Ledbetter. A funeral service will be held on Sunday, January 27, 2019 at 2:00 PM in the Chapel of Mowell Funeral Home, Fayetteville, with Chaplain Tom Livengood officiating. The family will receive friends on Saturday evening, January 26 2019 from 5:00-8:00 PM at the funeral home. Houseplants will be welcomed or memorial contributions can be made to The Right Recovery, Chassidy Pruitt, 5582 Hwy 129 South Cleveland, Georgia 30528, to benefit the Chapter ACA – Adult Children of Alcoholics & Dysfunctional Families. To send flowers or a remembrance gift to the family of Dorsey Duffie, Jr., please visit our Tribute Store. "Email Address" would like to share the life celebration of Dorsey Duffie, Jr.. Click on the "link" to go to share a favorite memory or leave a condolence message for the family.